The Time Machine Published in 1895, The Time Machine was the first novel to suggest the theme of time travel by machine, and along with other books by Wells, it was a forerunner of the contemporary science fiction genre, then known as “scientific romances.” Wells wrote mainly speculative fiction concerned with the contemporary problems of human society and its possible futures. While his works express a hope in human technology and progress, this is tempered by a realization of the possible extinction of humanity through the very same technology and the predilections of human nature. There is a strong ethical component to his work and this relates to the ambivalence that he often expressed about the potentialities of human nature. One of the central issues that concerned him was the disparity between the elite and the masses. The Time Machine explores these concerns in a setting 800,000 years into the future. 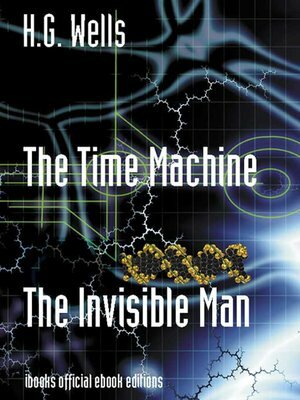 The Invisible Man A terrifying story from the author of The Time Machine and The War of the Worlds. An obscure scientist invents a way to render skin, bones, and blood invisible, and tries the formula on himself. Now he can go anywhere, menace anyone--sight unseen. He has only two problems: he cannot become visible again--and he has gone quite murderously insane. One of the most famous scientific fantasies ever written, this highly imaginative tale focuses on the powers and bold ventures of a scientist, who, after discovering the means to make himself invisible, unleashes a bizarre streak of terror on the inhabitants of an English village. Filled with suspense and psychological nuances of plot.